The game of joy for all the fans of Move the Ball. Move The Ball Classic is advanced version with all trending moves included for the gamers to enjoy it fully. Don’t want to loose your scores and wish to keep it safe with your account? MoveTheBall provided the Login with Facebook option to keep your achievements and coins safe with you. You can also share your achievements with your family and friends in social media directly from within Move The Ball Game. If you only want’s to try the game and not interested in going social, then there is an option to play as a guest, in Move The Ball Classic. 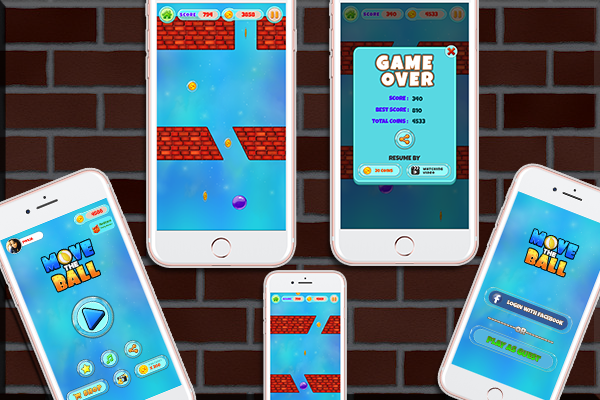 Move the ball classic, is simple yet addictive game for iPhone users with it’s catchy look and fun game level designs. The player only has to use up his mind and focus accurately by dragging his finger Left OR Right on the game screen to Move the Ball and Pass the Ball from gap between two walls without colliding it with the wall.